Gianni Infantino on Friday won FIFA’s presidential election and vowed to lead the scandal-tainted body into a new era as he faced immediate calls to ensure genuine reform. The 45-year-old UEFA general secretary scored a convincing victory in the battle to replace the disgraced Sepp Blatter, whose 18-year reign ended with FIFA mired in unprecedented crisis. 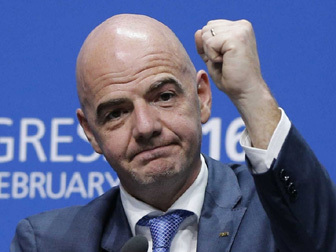 Infantino, a Swiss-Italian, defeated Asian rival Sheikh Salman bin Ebrahim Al Khalifa in the second round of the vote of 207 members. “FIFA has gone through sad times, moments of crisis, but those times are over,” he said, asserting that a “new era” had begun for world’s football’s governing body, dogged by a vast set of corruption scandals. Blatter, who many hold responsible for the culture of patronage and graft that plagued FIFA, congratulated Infantino on his win. “With his experience, his capacities, his sense of strategy and diplomacy, he has all the qualities to continue my work,” Blatter said in a statement. Infantino got 115 votes in the election’s second round while Asian Football Confederation president Sheikh Salman, from Bahrain, got 88. They were just three votes apart in the first round. Five candidates started the day in contention. Prince Ali bin al Hussein of Jordan and former FIFA official Jerome Champagne saw their support fizzle after the first round, while South African tycoon Tokyo Sexwale withdrew before polling opened. Infantino said he would have no trouble uniting world football after an election which exposed divides between Europe, Infantino’s power base, and voters in Asia and Africa. Sheikh Salman said he was looking forward to working with his campaign rival, and called for “unity” while stressing that FIFA needed to be more “inclusive and reflect the diversity of world football”. Infantino’s election was hailed by world figures such as Russia’s President Vladimir Putin and federation chiefs. Putin, whose country will host the 2018 World Cup, said Infantino comes into the post with “high authority”. The multilingual lawyer takes over leadership of the world’s top sport with its reputation at an all-time low. Blatter and UEFA president Michel Platini have been banned from football for six years, US prosecutors have charged 39 people over more than $200 million in football business bribes and Swiss authorities are investigating FIFA’s management and the awarding of hosting rights for the 2018 and 2022 World Cups. Infantino, who only entered the contest after Platini was ruled out, will also face immediate financial problems. Acting secretary-general Markus Kattner said “general uncertainty” caused by the crisis meant FIFA was $550 million (500 million euros) behind in its $5 billion budget target for 2015-2018. The shortfall could complicate Infantino’s ability to deliver on a campaign pledge of more than doubling the amount given back to national associations to over $1.2 billion in total every four years. Hours before he was elected, FIFA members approved a reform package that aims to limit the powers of the new president and to end the corruption that prevailed under Blatter. The president will become more like a corporate chairman of the board, providing strategic guidance but with less management authority. FIFA’s executive committee, which had become an epicentre of graft allegations, has been rebranded as a FIFA council. It will operate like a corporate board of directors. Measures such as declaring the salary of the new president to improve financial transparency were also included. But sponsors gave a cool reaction to the measures. “We urge FIFA’s new leadership to prioritise their implementation,” major backer Visa said of the reforms. Atlanta-based FIFA backers Coca-Cola said in a statement that deeds, not words, regarding accountability will be the critical factor in judging future support of Infantino’s FIFA. “Under Mr Infantino’s leadership, FIFA must regenerate itself,” it said. FIFA still has doubters and considerable judicial troubles ahead, particularly from the US investigation with trials that could start this year. Blatter, 79, the big absentee at the congress, suffered a spectacular fall over the last nine months. He has since been banned from football for six years for ethics breaches and could face criminal charges. Infantino also faced questions over his UEFA ties to Platini, but offered thanks for the French football legend’s years of support. He also pledged to work “tirelessly” to drag the organisation out of one of the darkest period’s in its 112-year history.